Here at ConservatoryLand®, we put our success down to the professionalism of our staff, the quality of our products and our extremely high level of service with expert technical knowledge that is second-to-none. Many of our orders are the result of existing customer recommendations resulting in the first-class reputation we now enjoy. We are extremely proud of our company and have thousands of satisfied customers. So why not add a little of our pride 2 to your home! It’s easy and anyone can do it! ConservatoryLand® make it possible for anyone to achieve their ‘Conservatory Dream’ at a fraction of the cost by supplying quality PVCu conservatories in kit form. All our conservatories are made-to- measure and specially designed for easy, trouble-free self-assembly by the average DIY’er with a basic set of tools, all backed up by an excellent after-sales service and a ten year guarantee. If you don’t feel confident enough to do the work yourself, you can use a builder to carry out the base and/or assembly work for you and still enjoy the huge cost savings. The main benefit of buying self-assembly is definitely the cost savings. We manufacture all our own conservatories and supply direct to you. There is no middleman, no profits made on surveys, groundwork, brickwork or installation and no salesmans’ commissions. All these cost savings are passed on to you. Whatever you want your conservatory to be, there is a style and size to suit your home, your needs and your budget. Anyone who owns a conservatory will tell you that it’s not just a home improvement, but an investment that adds true value to your home and quality to your life. ConservatoryLand® are the UK’s number one specialist manufacturers and suppliers of bespoke conservatories to the increasingly popular UK DIY market sector. We occupy approximately 20,000 sqft of office and factory space with state-of- the-art computer design and manufacturing facilities. ConservatoryLand® manufacture the complete conservatory — that means the frames, roof and our optional steel base, floor and wall system (ConservaBase), giving us complete control over our products and the service we provide to you. 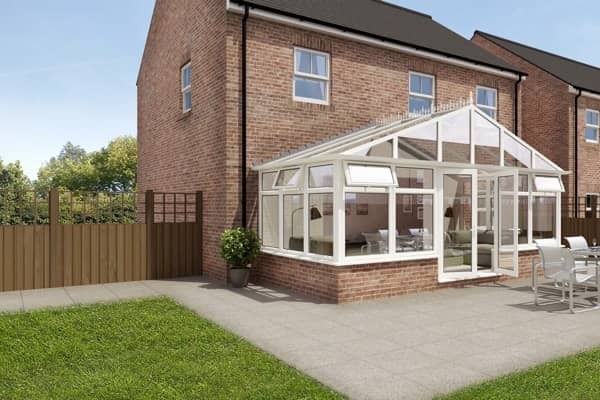 Our continuous product development policy results in the most up-to-date specifications and unique design features, making what we believe to be the most ‘DIY- friendly’ conservatories and DIY orangeries available today. ConservatoryLand® deliver all our own conservatories anywhere in England & Wales mainland with our own fleet of delivery vehicles and drivers, which eliminates the risk of damaged goods that can occur when using third-party carriers. We are always there to help with every aspect of your conservatory. With no delays and no fuss we achieve the perfect result every time. With ConservatoryLand® there are no hidden extras. We always quote for a fully functional conservatory — nobody wants a conservatory that is too small to be of use, or that has inadequate ventilation. What other conservatory suppliers charge as optional extras come as standard with ConservatoryLand®. You won’t be disappointed. We send you a quotation and a computer drawing of your conservatory, showing the exact design and sizes you have chosen, completely free of charge. If using a builder, you can use your drawing to get an accurate quotation for your conservatory base and conservatory installation or, if chosen, ConservaBase and conservatory installation. When you place your order we immediately send you your easy-to-follow base plan or ConservaBase pad plan, enabling you or your builder to complete the base while your conservatory is manufactured. If your base is already constructed, we will manufacture your conservatory to fit. The ConservatoryLand® service continues even after you’ve purchased your conservatory. You will benefit from having a complimentary personal technical advisor at your disposal, and a full aftersales service! We have our own indoor showroom. however ConservatoryLand® have real-life customers in almost every region of the UK, so we can arrange a viewing near to where you live. The country is our showroom – all you have to do is ask. See our interactive map to arrange your viewing.